Just what the title says, I don't enjoy getting my fingers all messy and I don't like getting a lot of pith. Is there a better way than just...peeling? I just came across this, and it just so happens I could use an orange in a slaw I'm making right now. Now if you just want to eat the orange, you can just pluck off the segments as you pop them into your mouth. 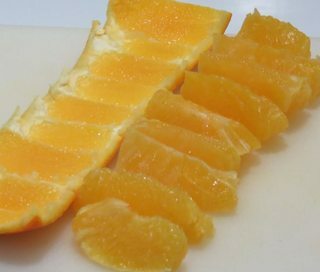 If you roll the orange around a bit first, before you lop off the ends (as in @Barry Staes' answer), it should make it even easier and more pith-free. With two passes of the knife and 5 seconds of picking at it, this is close enough for my slaw. 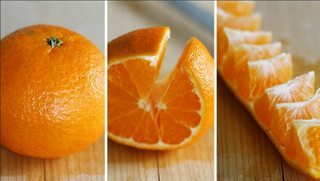 Just flatten the "caterpillar" as much as you can with one hand, and with one slice (or two), cut between the peel and the segments. I just picked away most of the remaining connective "stuff" and membranes with the knife and my fingers at this point, but a pair of kitchen shears would make even quicker work out of it. It's not absolutely perfect, the traditional method of supreming seen here would be the way to go if you're gunning for a Michelin Star, but this is fine for more casual applications. BTW, there is a pretty neat animated GIF on the linked page that will make it all clear if the pictures don't. 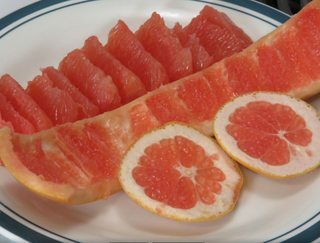 It works even better with grapefruit! 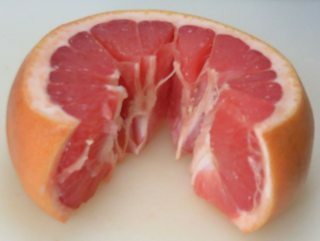 Open the grapefruit just enough to use a pair of kitchen shears to cut away the the connective membrane from the "points" of the segments (what would be at the center of intact fruit). While you're at it, remove any seeds. Be careful when you roll out the "caterpillar" to separate every segment and to put pressure evenly on all parts of the peel. The peel is a bit more prone to tearing than orange peel. Since the membranes between the segments are more like leather and less fragile than the membranes on orange segments, they are very easy to pluck away. This makes the supremed segments perfect. This gives better results even than the traditional method of supreming! First i roll it a few times on the table while pressing it gently. This loosens the skin from the meat. Then i make 4 (shallow!) incisions and peel at least 2 of them away including the top and bottom. (so let these stay attached somewhat) Since the skin is already loose, they almost fall off. All pieces stay whole. I then unroll the pieces, and voila. I do keep a napkin at hand, but a fork might work. 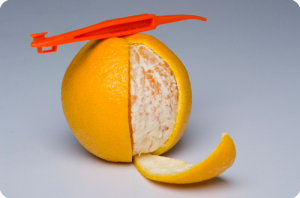 You could always just use an Orange Peeler. It's a simple, easy-to-use tool you can find in many kitchen convenience stores. 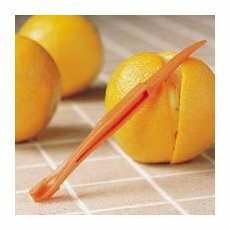 For those who can't follow the link - an orange peeler is a tool (usually orange, appropriately enough) with a hook on one end that digs into the orange peel, and a long partly-bent 'lever' at the other end. How you use it is simple - you dig the hook into the top of the orange, and run it down the peel from top to bottom. You make four even 'cuts' like this down the peel, then use the lever to pry each 'part' off. Or, if you're more of a utility-type person, a simple knife will do. Just run the kinfe down the peel as you would with the orange peeler (from top to bottom) then lever the peels out with the knife. A pairing knife would be ideal, but any sharp knife would do. But I find that using my teeth to remove the peel is easiest and least messy. First use a small knife to cut the shell vertically from top the bottom like meridians of earth. 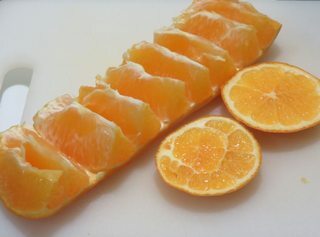 But cut only until fruit part, so not so deeply, 5-6 cut is enough, unite the cuts in the top and bottom of orange then you can peel them by pulling shell parts. If you extract the pole parts before peeling it is easier. I've tried many different ways - hands down this one is the easiest for me. For candied peel, I want as much of the pith as possible to remain with the peel. The end result is that there is very little left on the fruit which sounds like what you are trying to achieve. I'd suggest trying it once - my first impression was ho-hum but the first orange proved me wrong. 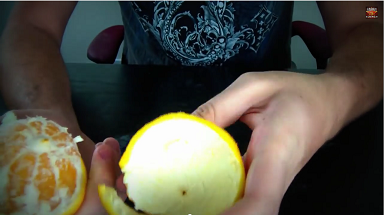 You cut through the peel all the way around the equator, then start from there and peel the two halves. Once you get started a bit on one half you can work your thumb under then around, and get each half off mostly in one piece, as you see in the picture below. Not the answer you're looking for? Browse other questions tagged peeling oranges or ask your own question. 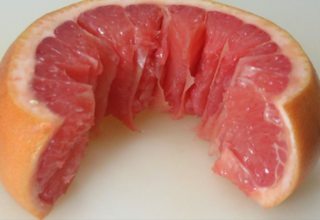 Easiest way to peel pomelos? How to prep jicama - is peeling necessary? Does ginger have to be peeled? If so how? easiest way to peel/skin a tongue? Is there an easy way to peel garlic?